Chondromalacia patella refers to the wearing out of the articular (soft) cartilage along the back side of the knee cap. 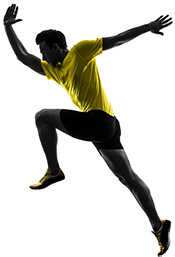 It often occurs from an impact injury to the knee or from maltracking of the patella. Chondromalacia patella is initially treated with physical therapy, strengthening exercises and surgical intervention if there is a mechanical issue. Lubrication (viscosupplementation) injections can help dismiss the symptoms and when combined with PRP may help to create a smoother surface. The patellar tendon connects the kneecap to the tibia. It becomes irritated when kneeling or cycling. It can be ruptured from a hyperflexion injury or direct impact. Rapid growth during the early teenage years sometimes leads to Osgood Schlatter's disease or pain at the insertion of the patellar tendon from a mismatch in the growth rate of the bone and the tissue, Fortunately most of the problems can be solved with careful physical therapy, soft tissue massage, anti-inflammatory treatments and sometimes growth factor injections. Sometimes the tissue underneath the tendon becomes scarred. A careful surgical release of this tissue usually solves the problem. If the tendon is fully torn, immediate surgical repair is indicated.